As expected, Lenovo has launched their latest phone the Lenovo K4 Note which is the successor to their K3 Note which was one of their best selling phones in India last year. Today, the K4 Note was finally unveiled in Delhi. Earlier Lenovo had been teasing about K4 Note’s fingerprint sensor and later they also had unveiled that it will feature a 2K display. K4 Note is not just a phone, it’s also an entertainment station for people who love real cinematic experience while watching movies and videos on their phones. 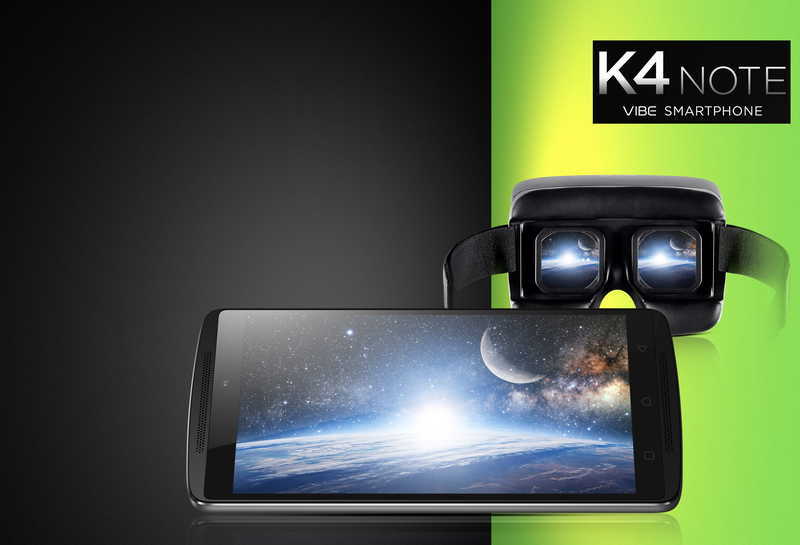 The K4 Note comes with TheaterMax technology which provides large screen, realistic experience when watched through the VR headset provided, and with that Lenovo K4 Note becomes the first of this kind to have come up with something like this and basically, the idea behind this is due to the fact that a large number of people nowadays consume media on their mobile devices. Not just in case of videos or movies, the TheaterMax also provides great 3D experience for gaming. Now coming to the phone itself, the Lenovo K4 Note is crafted beautifully with a curved back and wooden back covers which you can replace anytime (will be available soon), and the phone is just 3.8mm thick at its thinnest point and 9.15mm at the thickest. The K4 Note has a brilliant full HD 1080p display with Corning Gorilla Glass 3 protection and it also sports a great viewing angle of up to 178 degrees. The phone sports dual front speakers from Dolby with Dolby Atmos onboard- a perfect package for multimedia consumption. Now, regarding hardware the phone sports pretty solid specs, the phone has got 3GB of RAM as promised by Lenovo and along with a MediaTek 6753 octa-core processor, also there is a Mali T720-MP3 with up to 450MHz 3D graphics acceleration. Now, the fingerprint scanner is definitely an impressive feature, and the scanner is also capable of handling some other tasks apart from locking and unlocking. You can use simple gestures on the fingerprint scanner to open specific apps, take a picture etc. The Lenovo K4 Note comes with Wolfson audio codec and has three mics (top, bottom and side) to filter out noise, hence providing great recording quality. Regarding the camera, the K4 Note sports a 13MP rear shooter with a large f/2.2 aperture and LED flash, along with a front-facing 5MP camera for selfies. The phone packs a 3300mAh battery inside and it also has an NFC chip for secure transactions and other uses. The phone runs Android 5.1 out of the box, which I think they have adopted for now and may provide updates later on. In terms of connectivity, Lenovo K4 Note has a lot of options- LTE TDD Band 40/41 NW (2555MHz–2655MHz) and supports 1/3/5/7 /8/20 bands and both the SIM cards support 4G LTE, also it has Wi-Fi, NFC as well. In the storage department, the K4 Note has ample amount of space which is 16GB of internal storage and up to 128GB of expansion using microSD, it also supports USB OTG so that you can just use an OTG pen drive to enjoy multimedia or view files.The pricing of Lenovo K4 Note is set at Rs. 11999, and Lenovo has partnered with Skullcandy to launch Lenovo Skullcandy Ando headphones at Rs. 1299, which will be a separate accessory to purchase and take advantage of the Dolby Atmos technology. Lenovo is also going to sell an ANTVR headset for the VR content, and that would be sold for Rs. 1299. If purchased in a bundle, the cost will be Rs. 12499 (Phone + VR headset). The pricing seems to be quite aggressive, and the K4 Note is priced at Rs. 11999. Also, Lenovo has partnered with Skullcandy to launch Lenovo Skullcandy Ando headphones at Rs. 1299 (will be sold separately) which will provide the advantage of Dolby Atmos technology. Lenovo is also going to sell an ANTVR headset for the VR contentRs. 1299. If purchased in a priced at Rs. 1299. However, the K4 Note and VR bundle will costRs. 12499. The products will be Amazon exclusive and registration has already started for the flash sale, so register now on Amazon.in and get ready to purchase the bundle on 19th of Jan or if you are going to buy only the phone, you will have to wait another day as it will be sold on 20th Jan.